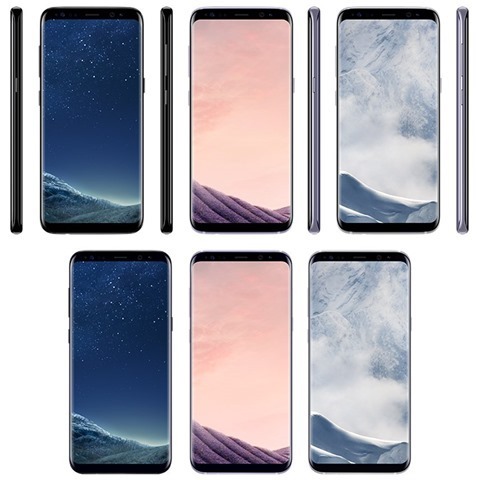 A new set of leaked press renders of the Samsung Galaxy S8 and S8 Plus, have revealed 3 colour variants of the phone. The photo you see here, is of the same, and are the Black Sky, Orchid Grey and Arctic Silver model S8 and S8 Plus. The design which is bezel-less is pretty much confirmed, and we can also see the metal power and volume rocker buttons on the devices' left, while the lone button on the right is expected to be for invoking the new personal digital assistant, Bixby. The Phones appear to be slightly thick, but it may look like that because of the curved back panel and edge panel. The Galaxy S8 and S8 Plus are expected to be powered by the Qualcomm Snapdragon 835 chipset, which the South Korean company co-engineered, with the chip maker. An Exynos 8895 chipset made by Samsung, will power the Asian variant of the devices, which will supposedly have 6GB of RAM, exclusively in China and South Korea, where phones with high memory capacities are popular. Samsung has already announced that the Galaxy S8 and S8 Plus will be unveiled on March 29th, so we just have to wait for 9 days to see the outcome.